Play a closest-to-the-hole challenge on the legendary St Andrews Links in the Pilsner Urquell 2010 Open Challenge! Anyone over 21 (or of legal drinking age of their country) can play, but only players in the US (except CA and TN), Canada, UK, Germany, Japan, Ireland, and Netherlands will be entered into the sweepstakes drawing for a chance to win a prize due to alcohol ad restrictions. Click here for details. The course for multiplayer games has changed from the back 9 of Bethpage Black to the front 9 of Bethpage Black. NASAgolfer is the Virtual U.S. Open 2009 Champion! Congratulations to Wayne Stopak, AKA NASAgolfer, who has been crowned the winner of the Virtual U.S. Open 2009. He shot a 66 to clinch the title, beating out over 200 players in the final round. More than 187,000 players entered the qualifying rounds with 234 making the cut at even par, 70. The top score of the qualifying round was played by AvatarLee with a 61. The toughest holes of the championship round proved to be 5 and 15 which received more double bogeys than any other. The pressure was definitely felt by all who made the qualifying cut. Runner-up Bart6961 said, “I thought I was going to give NASA a run for it with -4 after the first 6 holes, but the pressure got to me.” Nivlac and ncviz made impressive showings and took early leads, but in the end it was NASAgolfer who played the game of his life. Today we announced St Andrews as our next course that will be available to play. 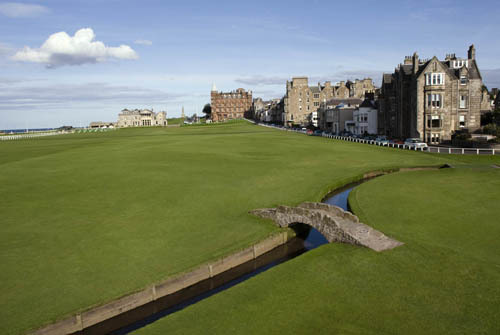 The Old Course at St Andrews will be available starting June 25, so be on the lookout! 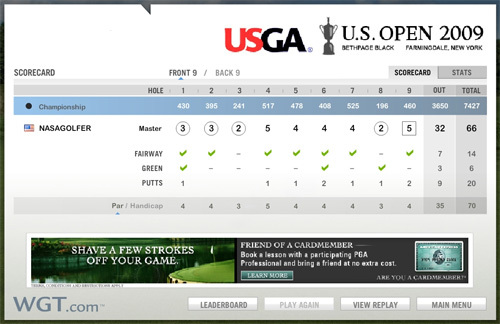 The Virtual U.S. Open Championship round has kicked off! Congratulations to the 234 players who made the cut. We wish you the best of luck, and want to remind you to play your round by tomorrow, June 23, at 11:59PM Pacific Time. Everyone who ties for first will play in a playoff round on June 24. Click here to see the list of everyone who made the cut. Good luck and thank you to everyone who participated! You have until 11:59PM PT tonight to shoot your best score! The competition is intense, and the cutline is 70. Good luck everyone! 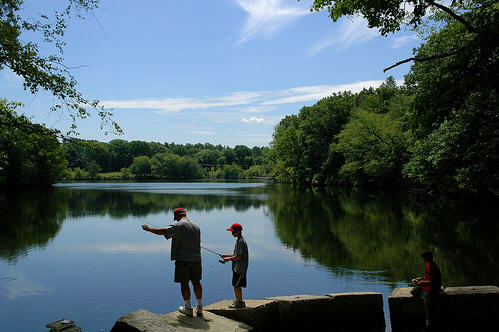 WGT wishes everyone a Happy Father's Day! The first day of competition at Bethpage kicks off to massive amounts of rain that caused delays. Check out Tyler's coverage of the day as well as an update on the Virtual U.S. Open. Click here to see the official Virtual U.S. Open YouTube channel. There are no swimming pools covering the Bethpage Black greens at WGT, so play for your chance to qualify for the Virtual U.S. Open 2009 Championship from June 22 - 23. Winner gets a trip for two to 2010's U.S. Open at Pebble Beach. Only three days left to qualify! Video blogger Tyler DeZubay covers the final day of the U.S. Open practice rounds, where he follows Phil Mickelson and Jim Furyk. Click here to see the official Virtual U.S. Open YouTube channel. Video blogger Tyler DeZubay covers day 2 of the U.S. Open practice rounds, where he follows Robert Allenby and Luke Donald. Click here to see the official Virtual U.S. Open YouTube channel.